A 0.25 μm CMOS mixed-signal baseband and MAC processor for the IEEE 802.11a WLAN standard in 0.25 μm CMOS occupies 6.8 x 6.8 mm2 and contains 4.0 M transistors in a 196-pin BGA package. Power consumption for transmit and receive is 326 mW and 452 mW. Additional data rates up to 108 Mb/s are supported. 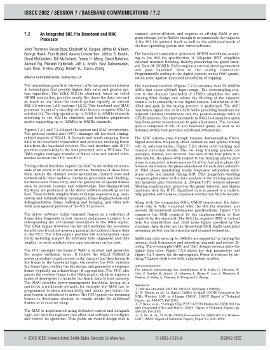 J. Thomson, B. Baas, et al., "An Integrated 802.11a Baseband and MAC Processor," International Solid-State Circuits Conference (ISSCC), February 2002.